Phil Dickie (centre) accepts the LO Legacy Award from association president, Warren Patterson (left) and executive director, Tony DiGiovanni. 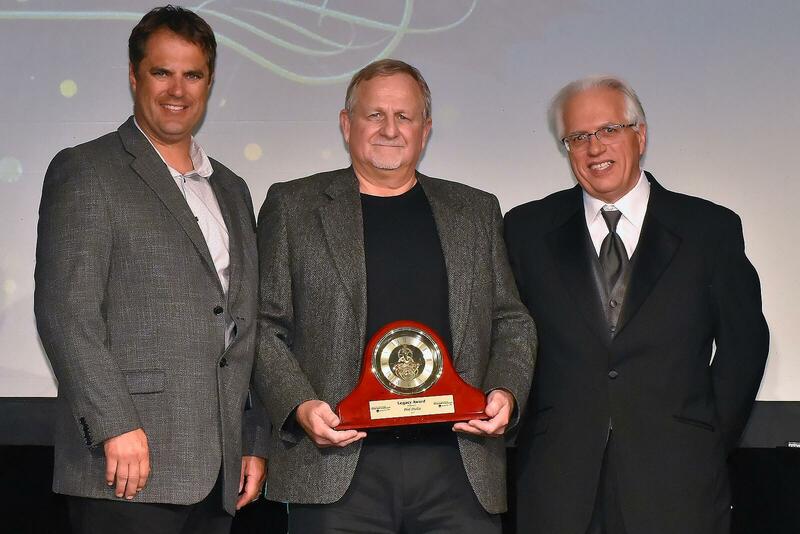 The 46th annual Landscape Ontario Awards of Excellence ceremony was held Jan. 8, 2019 at the Plaza Ballroom of the Delta Hotels Toronto Airport. Hosted by Laurie-Ann Stuart, owner of LA Gardens, the theme of “Legacy” supported this year’s ceremony and included three short videos highlighting past winners of the Dunington-Grubb Award. Awarded to the highest overall scoring project from the various construction categories, this year’s Dunington-Grubb was presented to Dutch Touch Landscaping. The Casey Van Maris Award was given to Pro-Land Landscape Construction, as the project awarded the highest marks for execution of unique and innovative design in landscaping. The Don Salivan Grounds Management Award was given to Yorkshire Garden Services, as the top project among entries in the maintenance program. The evening ceremony also handed out plaques to Landscape Ontario member projects in the construction, maintenance and design programs, including landscape lighting and irrigation. A number of individual LO members were also recognized for their outstanding contributions to advancing the profession. Recipients include: Richard Burch, Chapter Achievement Award; Brian Brisbin, Environmental Award; Paul Zammit, Garden Communicator’s Award; Robert Allen and Jim Bauer, Honourary Lifetime Award; Phil Dickie, Legacy Award; and Michael LaPorte, Past President’s Award. Prosperity Partners Leadership Awards for 2019 were presented to: Lindsay Drake Nightingale, Gabriel Matamoros, Lindsey Ross, Garry Reisky, Janet Mott, Christine Moffit, and John Larsen. The Horticulture Educator/Partner of the Year 2019 is Lisa Ambaye. As the ceremony looked back at past achievements, it also promised a look at the future of the profession with the announcement of this year’s many scholarship recipients. As they were announced, students took to the stage to join representatives from the Ontario Horticultural Trades Foundation and Cullen Family Scholarship program. Another group of students also took centre stage as winners of the annual Come Alive Outside Design Challenge. Students from Algonquin College participated back in the fall of 2017, working with elementary and high school students, teachers, and landscape professionals to design a landscape plan for the entire schoolyard at Georges Vanier Catholic Public School in Belleville, Ont. Landscape Ontario would like to thank presenting sponsor, G&L Group, supporting partners, Connon/CBV Holdings and Dynascape software, as well as the many volunteers and judges who assisted with this year’s awards program. Thanks also to Beth Edney for helping with the décor for the event. A full list of sponsors and winners, as well as a video of this year’s ceremony, can be found online at LOawards.com.